Too many options leads to disaster…or at least a big mess. Here is a mild example of what happens when I leave my toddler in the play area for 5 minutes while I vacuum another area. At least most of the toys stayed in the bins. 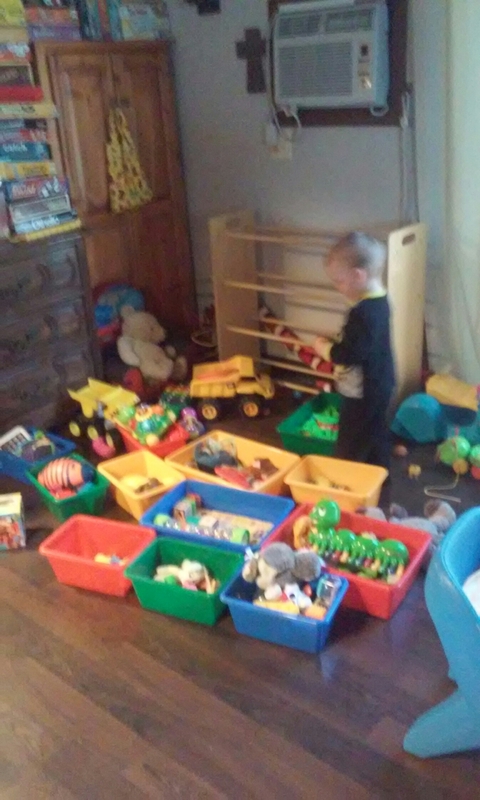 ;) When we first purchased these bins I sorted his toys and kept them that way for about a week before I gave up. Having 3 boys in the house, I know I need to have things ready to entertain them, but I think our tendency to shop at thrift stores has caused an over abundance. My little guy who is two, just loves Mickey Mouse right now. My husband found some Mickey related items while shopping at the dollar store recently, and they just happen to be learning tools too. He found a numbers and counting workbook, a box of shape/color flash cards and a puzzle. When my son was first given the workbook, he was excited to see Mickey, but that was all he was interested in. Then he decided to rip apart the cover of the book, but he kept the inner pages intact. He spent some time flipping through the pages, talking about the characters in it, or the different items pictured. Finally tonight he has shown some interest to write in it, scribble really.😉 He has been “counting” for a while now, so I was able to show him pictures of the numbers that he likes to say. He really likes saying one and two. Sometimes he will even count backwards like a countdown. It’s so cute. For some reason he likes the number six. He calls it sick though. He’ll often say “one, two, sick “. He loved the flash cards too. It took him about twenty seconds to rip open the package and spread the cards all over our livingroom. He will show me a card, so I can tell him the shape and color. I don’t want to pressure him to learn too much, but I am happy to answer his questions. I want him to enjoy the learning process and I want to teach him from observations I make of his interests. I just love sitting with my feet up, watching the fire flickering in my wood stove. The coziness of the warmth and light is just so calming. Then…. the toddler starts calling me to watch his game he has created. Watching once is not enough. He needs to show me over and over again. I know he’s excited about creating something, and I am very proud of that. 😊 At least the baby is napping peacefully and the big boy is quiet in his room too.